Last year I was given the opportunity to participate in some craft workshops for the local MENCAP group (a group of adults who have various physical and mental difficulties). 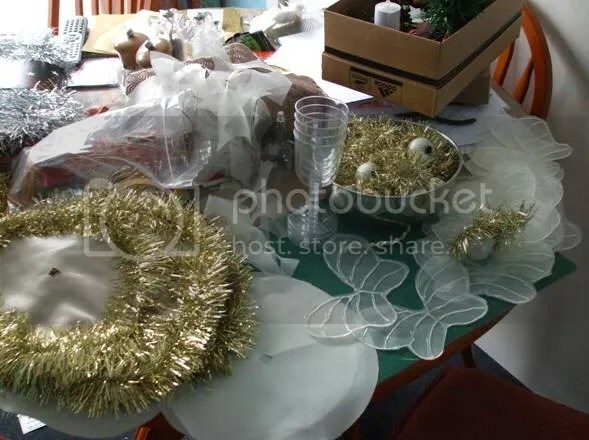 I was asked to design some Christmas themed activities that involved the creation of finished pieces of 3D craftwork and then demonstrate to and help the members of the group to make up the designs for themselves. It was quite a feat – trying to think up ideas for interesting and worthwhile activities that were challenging – but not impossible for the members of the group to achieve – with a bit of help if necessary, but I came up with a few ideas and successfully delivered the workshops – and they must have liked what I did because they have invited me to do 3 more this year! The group is run by volunteers and is funded by donations so there is very little spare money to be had. Materials for activities have to be carefully sourced to get the best value and ‘reduce reuse and recycle’ is a bit of a mantra. To get the best results for everybody in the group I make up ‘kits’ for each design – providing everything that is needed and where there is a particularly difficult technique or something too dangerous for the group to do individually I provide that piece ready constructed within the kit. This year I have been asked to make enough kits for each member of the group and about 10 extra – which they hope to be able to make up and then sell to help to raise money for the group. So I have gone into ‘mass production’ mode!! I have only had a couple of days to come up with my 3 designs – and the first workshop is on Monday…so jewellery making has gone out of the window for now and I am into making a mess in a big way! My first design is for a Christmas Fairy….and it was influenced by the fact that I was given a huge bundle of fabric by a lovely lady called Clare. I hope she will approve of the use to which I have put it. Thank you Clare!! 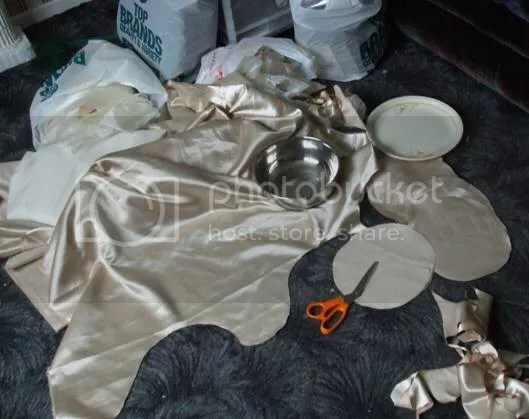 The living room floor of my house is now the fabric cutting area and storage area for bags of purchased materials. My kitchen work surface doubles up as the workstation for messy and/or dangerous glueing and screwing type activities. 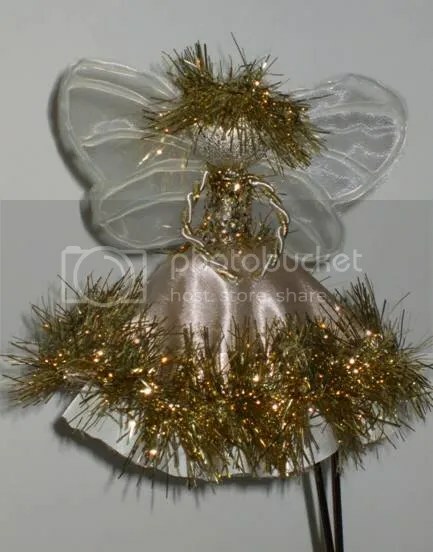 I have used loads of hot glue sticks in making the fairies’ wings, sticking wired tinsel to their skirts and giving them ‘tatty’ hairdos by sticking tinsel wigs to their heads. 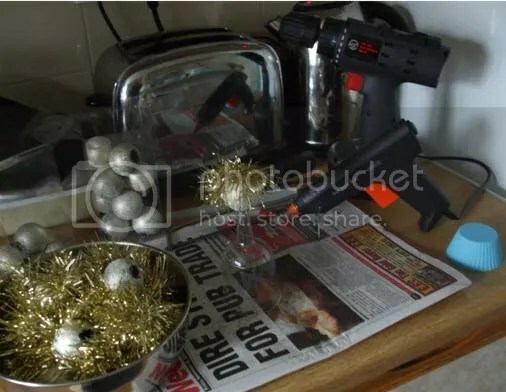 And their heads have been made from plastic baubles which have had the hacksaw, drill and countersinker treatment to give them a point of attachment to the main body, which….wait for it….is a disposable plastic wineglass!!!! Hah! I am just so brilliant sometimes!!! Hahaha! The dining table is now my main kit construction area. Sorry everybody! Dinner on laps for the next day or two!! And the carpet of the entire ground floor of my house is scattered with flecks of tinsel and glitter! Ahhhh!! Pretty!!!!! Hmmmm…I think that was what my dearly beloved muttered anyway!!!! While the house is in such a mess I think it is a good idea to try to get the kits for week 2 and week 3 done as well…I really do have a long-suffering family! She is designed to sit a-top the Christmas tree, as the plastic wine glass extends right down the stem of the glass giving a good 4 inches (10cm) of room to insert the top of the tree. But she is equally as stable standing on a table – and I hope you will agree – she is beautiful enough to grace any area in which she is placed. I hope we have loads of fun making her 25 cousins on Monday and that the 10 destined for sale make a nice little packet of money to fund some of next years activities! I’ll post my week 2 design next week. As usual – I would love your comments!